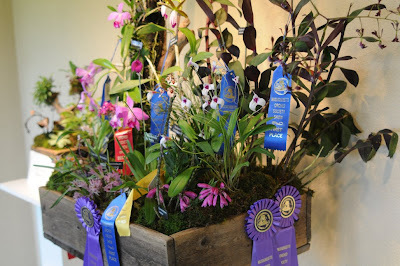 JUST A DOG SHOW WILL HAVE A DOG THAT SEEMS TO WIN ACROSS THE COUNTRY, SO IT IS WITH SOME PLANTS. THIS IMPRESSIVE SPECIMEN OF ABROMEITIELLA ( OR Deuterocohnia),COMES FROM THE GREENHOUSE OF PLANT COLLECTOR ART SCARPA. IT DIDnT COME IN FIRST AT THIS SHOW, BUT IT HAS AT MOST EVERY OTHER EAST COAST SHOW, FROM NEWPORT TO BOSTON. 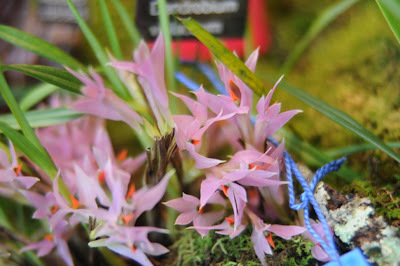 Yesterday we attended the Massachusetts Cactus and Succulent Society show, held at Tower Hill Botanic Garden in Boylston, MA. I've been trying to resist collecting cacti and succulents, but one can stay away only so long. Attending a show like this is very inspiring, we brought along a friend of ours who had never been to a plant society show, and she left with a tray of plants, and I think I can sense that this won't be the last time she goes to a society show. DYCKIA and related species have striking leaf forms, and a collection of like-species is sharp! 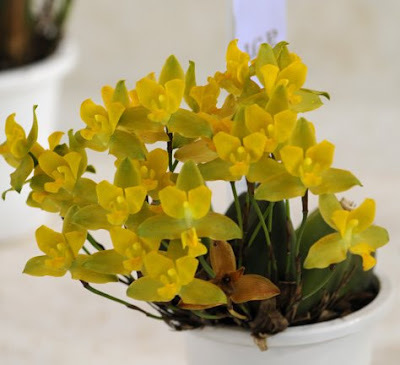 Plant societies shows often have plant sales, tables where members sell cutting and starts from their own collections, and specialist nurseries who sell plants often not found anywhere else. I left with a tray of Gasteria species and Haworthia species, as well as a large Bulbine caulescens from the rare plant auction which I was trying to avoid, but this caught my eye ( and ear) as I was passing by. Gladiolus, straight and tall, at a Gladiolus society show hosted by the Western Massachusetts Gladiolus Society. The poor, poor gladiolus. 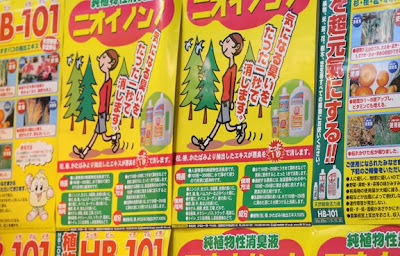 Under-appreciated, and more likely to be associated with funeral sprays and rubber-banded into boring take-away bundles at the super market, than the show bench, the lowly glad is sad. But wait.....it's not too late to change ones association with the Gladiolus....instead of church alter , think mass planting in perennial border. 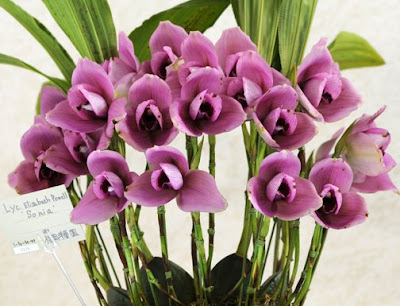 Instead funeral spray , think orchids on a stick. Instead of thinking of mesh bags at Home Depot t, think stately 5 foot tall spikes of fabulous color. Don't be mad, be glad! Here, a mini Glad called 'Holy Moly', captured a top award. Here is my odd observation: Glads are one of those plants that for whatever reason, men grow more than women. 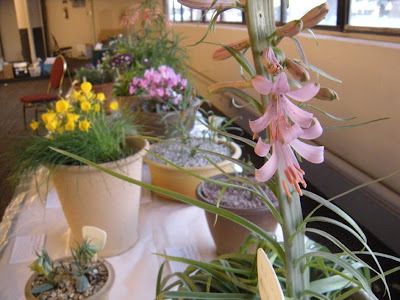 Probably because in the 1940's, the Gladiolus was sold in feed and grain and hardware stores, where corms could be purchased in the spring, when one bought their seed potatoes or onion sets. These were not ladies plants, and thus, were banished to the rear of the Asparagus beds or behind tomato plants, as if men were embarrassed to grow such lovely and yet, frivolous flowers. So if you think ho hum, when someone mentions the Glad, think again. If the Dahlia can have a comeback party, maybe it's also time for the show Glad to have it's coming out party. If show choir's cna make a comeback, so too can the Glad. Sure, they are more garishly colored, but I think the reasons men aren't repelled by them has to do more with their ease of culture ( carefree) than it has with the fact that they are flowers. I equate the cultural preference of men owning the outside grill, of that with men growing glads. Glads are acceptable to men, because they are generally grown in the vegetable garden, and not in borders or beds. One never fusses over them; Glad's are a hose-em-down, spread-manure-on-em type of plant. They are Simple and straight forward. They are not emotional or frilly. Planted in stiff rows, they are more soldier like than graceful. Glad's are man flowers through and through, as male as a steak on the grill. They come in a color palette that ranged from fire engine red, to John Deer yellow. 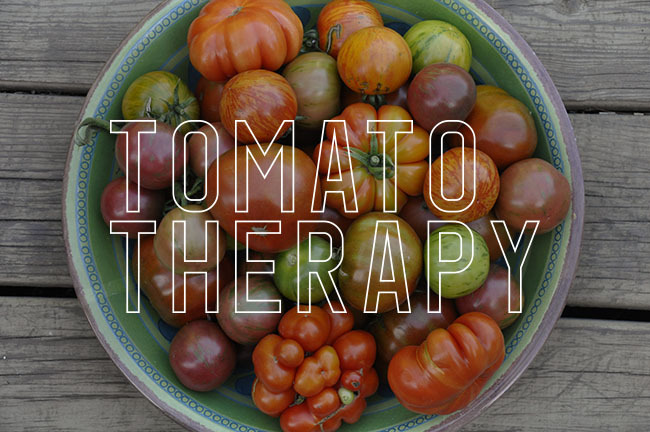 I associate them with steamy summer afternoons picking string beans under the hot sun, baseball game playing on an outdoor radio, barefoot and shirtless, a cooler of beer or a swig of cool water from a garden hose. Glad's are pure summer. 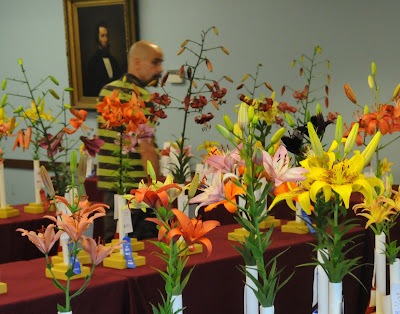 Joe examines the entries at the 150th Lily Show of the New England Lily Society. 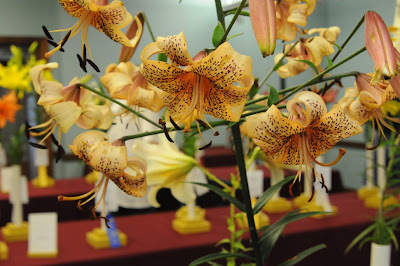 Lily Shows are one of the best places to find varieties that are rarely seen at garden centers. 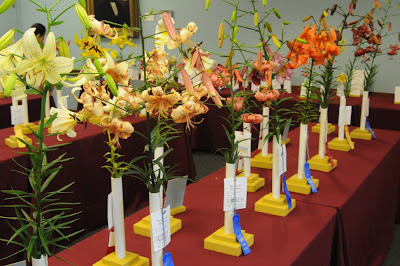 Last weekend we attended the New England Lily Society Show at the Tower Hill Botanic Garden. I remember both visiting and exhibiting in this Lily show when I was a kid, when the group was called the New England Regional Lily Group, and their shows would be held at the Worcester County Horticultural Society's Horticultural Hall, a massive space designed in the 19th C. as an exhibition hall for plant enthusiasts. 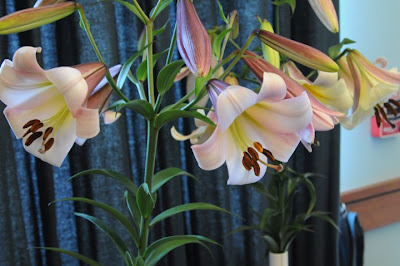 In the 1960's and 1970's, the hall would be filled with towering stems of fragrant lilies that exhibitors would groom and enter from all over New England. 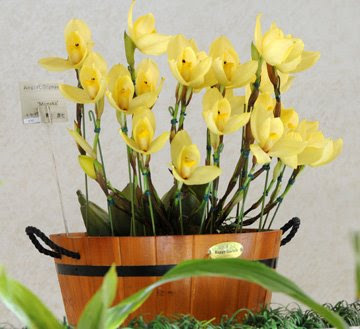 From early in the morning, exhibitors would start arriving, or even the night before, so that they would have time emptying out their vans and station wagons where the tall stems would be transported so carefully with cotton between their buds, or newspaper taped around their stems. Carefully sorted and then placed in each Class, the lilies would be judged for perfection. I'm not sure if this is one of those things that one romances about from the perspective of the present, and remembers a grander and larger exhibit, but I think I am pretty certain that this current show included many fewer entries and stems of lilies. The reasons are many, first, all plant societies are losing memberships for many reasons, and second, the lily beetle, which is should be another post in itself, for this lady bug look-alike is an invasive species that is destroying many if not most of our lilies, native and hybrid and is the only insect I use insecticide on, and third, lilies are rarely grown since most people buy their plants in the spring, and fall, and usually in-bloom, so they rarely buy summer blooming bulbs like lilies. Do try true lilies, at one of the Lily mail order nurseries, or visit your local nursery since many now have potted lilies for sale, that are in-bud, and are not much more than actual hybrid bulbs planted in the autumn. If you choose to order bulbs, order them now, and then when they are shipped in October when dormant, they can be placed in the garden for color next summer. Lilies get better with each year, as the bulbs become larger, which is a fun phenomenon to watch. My favorite are down-facing Asiatics, the turks cap types which are hard to find, except at lily nurseries, and the trumpets, which have an incredible fragrance akin to menthol, jasmine and banana all mixed up, summer for my nose! 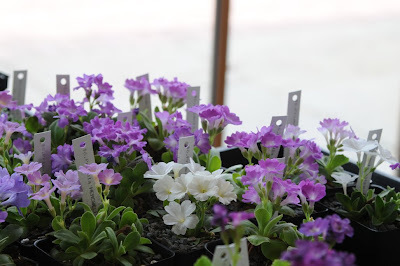 Last weekend we hosted the American Primrose Society, the APS which seems to becoming an annual even for us. THis group has become a close circle of friends, for as plant societies go, this one is particularly friendly. It's funny for guys our age, most of our friends if not all with the exception of three or four, are plant society members. The APS is worth joining, for all plant societies offer a rare, tremendous value, membership is often the same as a magazine subscription, and the benefits are great, far beyond the quarterly journals, all worth saving for a lifetime of reading at bedside, for what cost is friendship. 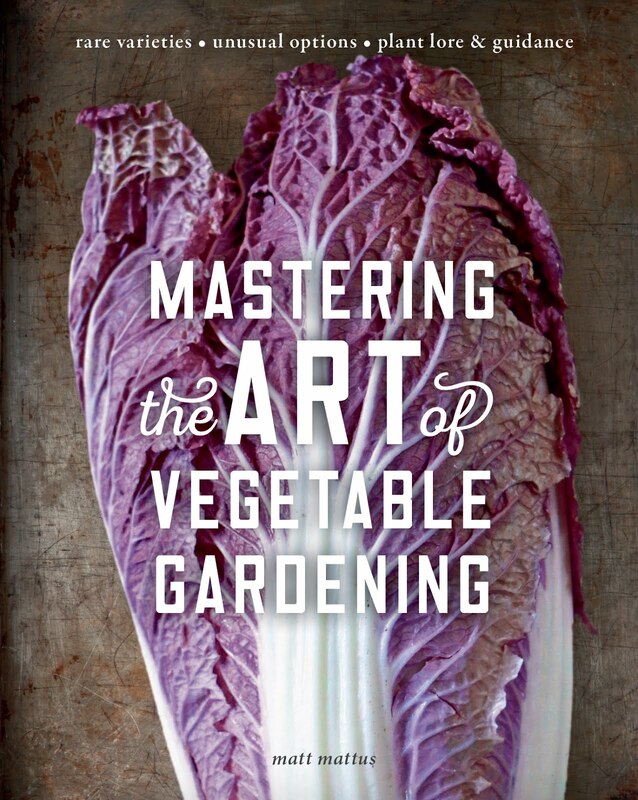 I must be brief, since this is old news and this is the busiest time of the gardening season. 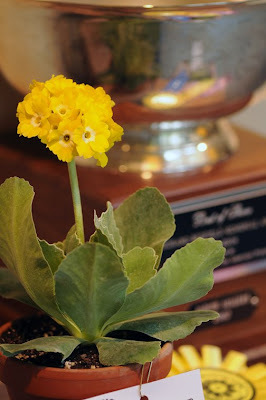 I would be remiss if I did not offer congratulations to Joe, for being voted in as president of the American Primrose Society. The next two years should prove interesting as he attempts to guide a plant society toward modernism and respect for its heritage. He will look upon the society elders and veterans of the job for guidance and support, as well as new muses fromt he modern world to help him navigate a twentieth Century model through a Twenty first Century world of 900 TV channels, instant messaging and disposable media. Any plant society today, who imagines a future of sameness and growth is sadly, blind. The future, if any, for these groups must include careful, yet swift change in understanding their consumer, and in delivering more experiencial value if they ever expect to move forward. I can't think of one plant society, which I belong to, which is not experiencing a fatal loss of membership ( and I belong to a few societies! ), most are blind and are choosing to ignore the trend, but it is inevitable, and those few who are offering new values may succeed in surviving a bit longer. But most are so shocked and angry at their unexplained loss of membership, that they choose to shut their doors, and minds, even more, rather than to merge, or redefine themselves. Today, in a world where even the largest corporations and largest financial institutions are redefining themselves, so too must the simple plant society. Understanding what they provide to members is key, and many may evolve from the world of print and journal, towards an online and digital life.Taking the lead from the world of science and medicine. THe journal NATURE, the botanical research sites for botanists and most of science have moved away from the dusty library and printed journal, to a digital world. Since plant societies are somewhere inbetween the more serious scientist and reasearcher and the common, gardener, a model may be the world of science. After all, Mr. Gore, they did, indeed, invent the internet for just this purpose before we, the masses discovered its dating possibilities. 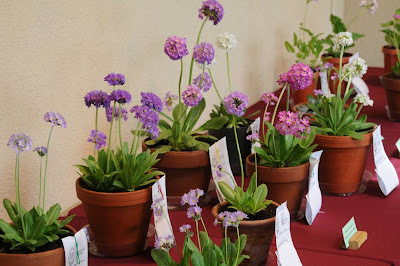 But back to some photos from our weekend at the national primrose show. 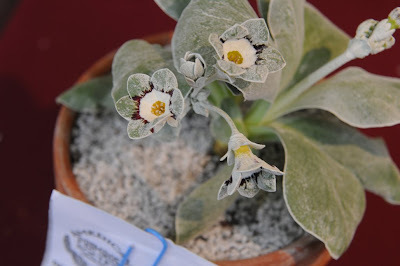 A first for me, A pot of Notholirion thomsonianum, of course! Oh, to live and garden in the North West.......someone please find me a job here! A basket of select miniature Narcissus by Cherry Creek Daffodils, at the first day of the plant sale at the NATIONAL ROCK GARDEN SOCIETY'S WESTERN WINTER STUDY WEEKEND. 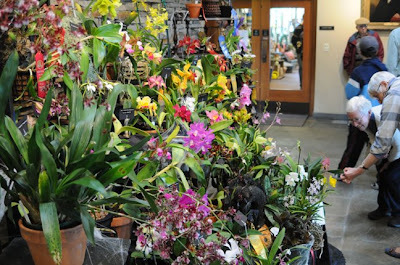 It's Friday, and people are arriving at the Double Tree Hotel here in Portland Oregon, and rushing out to the parking lot where there are in impressive about of plant vendors with tables of the most incredible plant material that any hortiphyle can imagine. 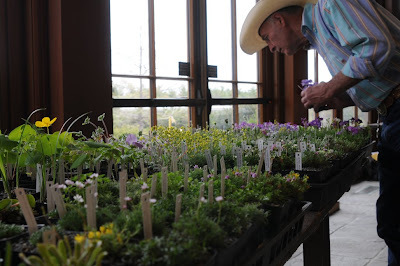 Gosseler Farms, with rare shrubs, magnolias and perennials, Cherry Creek Daffodils with amazing miniature daff's all in bloom, Bovees Nursery with Vyreya and Rhody's, Siskiyou Rare Plant Nursery, Mt. Tahoma Nursery, Hedgerows Nursery, basically every catalog I have sitting on my coffee table at home, has a table out there.....what was I ever thinking bringing myself to a west coast plant conference, and believing that I would leave empty handed! Actually, I did bring an empty suitcase, just in case. It's full, now! 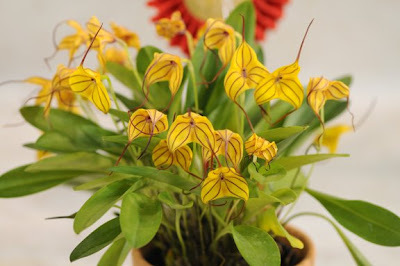 A potted Fritillaria bithynica in the plant show. I am so impressed with the growers here in the N.W. 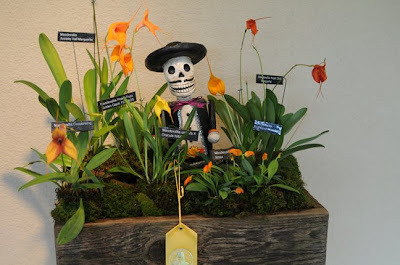 Of course, thisis Frit country, but the members of the host chapter of NARGS, the Columbia-Willamette Chapter of the North American Rock Garden Society really have their, um...Frits together on this weekend. The speakers, the plant vendors, the location, even though I keep being told that the best NARGS chapter in the world in apparently the Rocky Mountain Chapter ( someone still needs to prove this to me! ), this host chapter has really raised the bar on how to kick off a weekend for us crazy plant people. I can't wait to see what's next. The plant show looks like an AGS show, in England. Very impressive. A busy weekend. 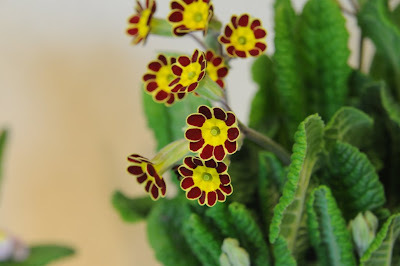 The Seven States Daffodil Show and the New England Primula Society Show. 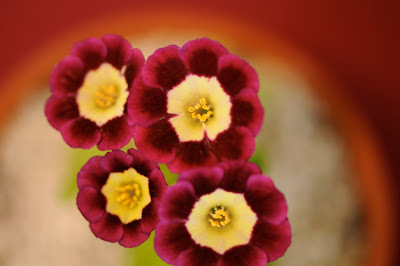 The judges we're gushing over this auricula grown by Judith Sellers from New York state. 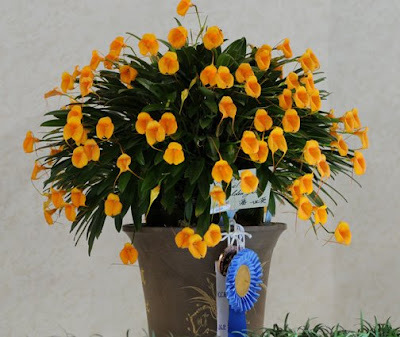 Spring weekends in May are busy enough, with all of the transplanting, dividing, seed sowing, rototilling, garden clean-up, pruning, raking, and garden center cruising, when you throw in two major flower shows - it can really get crazy. But we would not do it if we didn't love it, right? 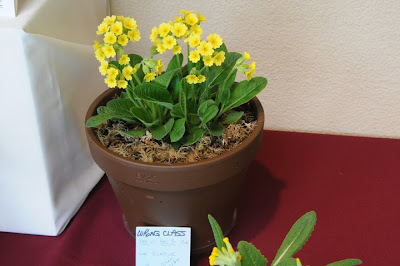 This past weekend hosted the New England Primrose Society show at Tower Hill Botanic Garden in Boylston, MA, a show we annually host at this weekend, a date which we share with the Seven States Daffodil Show. 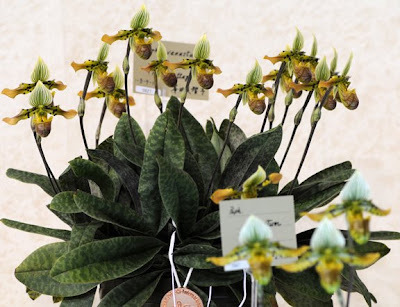 If you have never been to a flower show, it's a routine that enthusiasts eagerly and grudgingly await for, the highlight of the year for many who love, collect and grow a particular genus. Moreover, it is a social event, a time where one can do more than meet, and compete, since these weekends are more about early breakfasts in the cold, lunchmeat luncheons with coffee and pastry, but since people drive and fly in with thier precious cargo, it is also a time of party's and cocktail events in the evening at local members' homes ( like ours), which is fun. 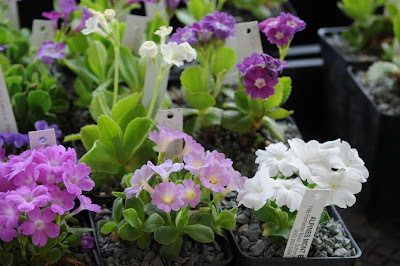 All in all, it's a quite like a holiday, for 'family' members who connect over a passion ( plants) who exchange with thier long lost friends, gifts of highly desired plants, a cutting or a seedling, a glass of wine, and a time to catch up with gardening stories. 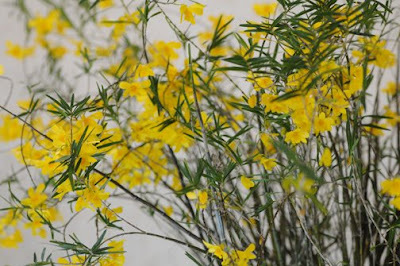 Here, a group of like-minded people can leave spouses at home, and sit in a room of total strangers, and all have a conversation and glass or two of wine with new friends, all who have an immediate connection with a plant that they love - instant friends. 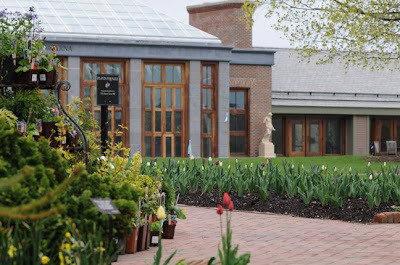 The gardens at Tower Hill Botanic Garden, a public horticultural center in the middle of Massachusetts formed twenty years ago when the Worcester Horticultural Society sold it's exhibition hall ( Horticultural Hall) in downtown Worcester, and purchased a farm high on a hill in nearby Boylston, MA) with the ultimate goal of creating a major botanic garden. 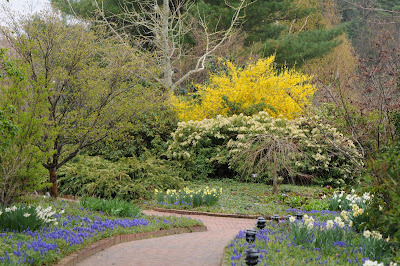 Currently in Phase 2 of a long-term strategic plan, the gardens are beginning to grow into a magnificent space. 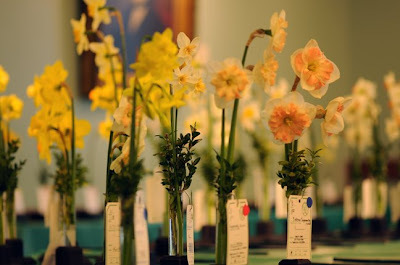 A view of the Daffodil hall where tidy rows of Narcissus species and hybrids are displayed and judged against each other, at the Daffodil Society's Seven State Daffodil Show. 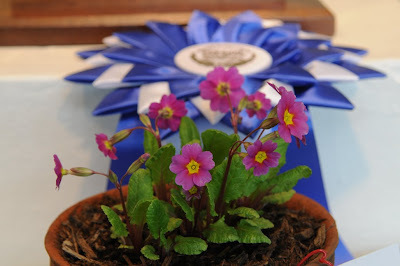 Aurucula expert, Susan Schnare exhibited many of her auricla primroses, and many won blue ribbons. 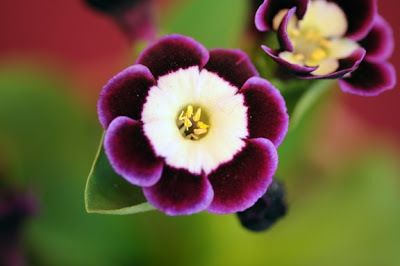 A stunning auricula grown by Susan Schnare, took top honors at the New England Primula Show. 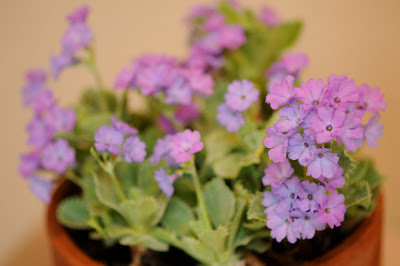 An impressive pan of Primula marginata grown by Kris Fenderson of New Hampshire. 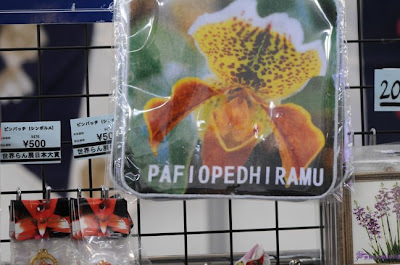 Just as any orchid show, half the floor is dedicated to retailers selling everything from plants, to fertilizer. 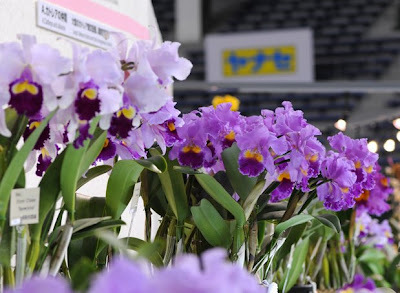 Jet lag from the Orient is a nasty thing to recover from, but I did want to recap my trip with some images of the best orchids which I viewed wile visiting the International Orchid Grand Prix in Tokyo. 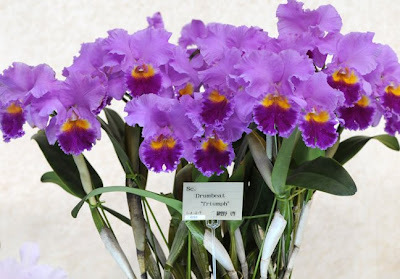 A Cattleya with lots of blooms. 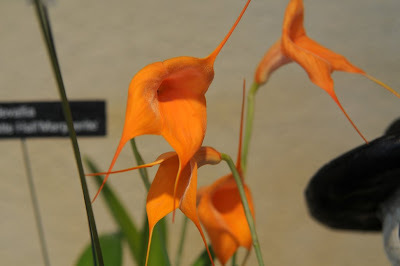 This is a show, where the specimens have an incredible number of blossoms. A Dracula species that I did not happen to get the name of. This is a show where the whirr and buzz of digital cameras and cell phones add to the experience. 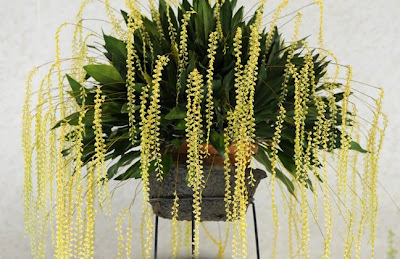 First on my wish list, the Australian, Dendrobium speciosum. 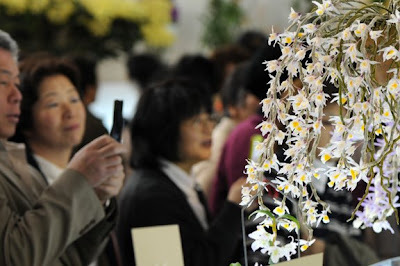 Second on my wish list, Dendrobium hancockii, a branchy, deciduous Dendro that was massive in width. I HAVE to get this one! Lycaste are perhaps the most impressive at this show. 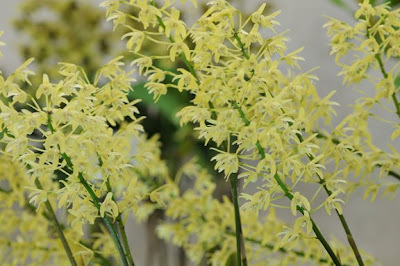 I think the cool winters in Japan provide the perfect conditions for this orchid.